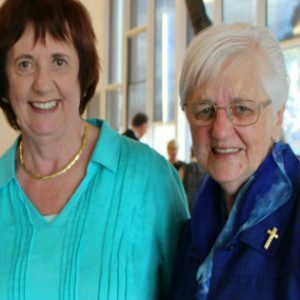 In December, Sr Liz Costigan said goodbye to Catholic Ladies College, Eltham, after a long-term ministry at the school. She was farewelled with a very special morning tea, and a warm and loving salute from the principal, Stephanie Evans.Stephanie said, inter alia:“Our girls will miss you, they have cherished your presence at College events. 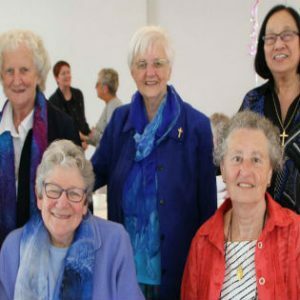 I can guarantee the comment that will be made by the girls about you and Judith Peart’s guest appearance at the annual final Year 12 assembly – ‘how cute are they.’ You will always have a special place at CLC. You may be moving to Essendon, closer to our cousins, but don’t forget where you came from, where your loyalties and allegiances lie. Remember, we are higher on the prayer pecking order.“Know that we will continue to share your story with the young women who join our College as we teach them about the history of CLC and inspire them with stories of women like yourself, strong, faith filled, courageous and compassionate women. Women who have and continue to make a difference in the lives of others. “When faced with personal and health challenges, your inner strength and spirit have held you in good stead. In the words of St Francis de Sales: Nothing is so strong as gentleness; nothing so gentle as real strength. Thank you for letting us be there for you. We have been privileged to have been part of your special celebrations, your 80th birthday last year, and more recently your Diamond Jubilee. You have touched the lives of so many members of this College community in different ways. Liz, when I think of you, I think about and I feel a beautiful gentle breeze, bringing love, compassion, joy and inviting discernment; spreading the love of Christ amongst us.